It's a short week for me. And a long one. On the one hand I'll work two days in the office and one from home. On the other hand I'll also volunteer, cook, attend a dinner, throw a party, and host a houseguest over the course of the days I'm not in the office. It's fun stuff, good stuff, yummy in the tummy stuff and there's a weekend at the end of it, even. This all amounts to a certain lack of oomph in attacking the work days. I arrived today to find out I'd made mistakes and immediately felt awful and even less like being here. I've spiraled down a little into that place where you feel as though nothing you do is going to make much difference (it will) so why bother? I'm doing stuff anyway and I do seem to be making progress but my insides are jelly and my brain requires frequent reeling in like an over-excited Marlin. There will be blood on the decks before this fight is through! Rather than subject you to all the many "jokes" in my head I leave you with this picture of a cleaner in Rome's Tremeni train station. Riding around on her miniature floor buffer/supply cart I find her both hilarious and ultra cool. I'd love to ride one of those. Wouldn't you? Maybe it's a Monday thing.... because I'm feeling exactly the same way! Although I had to move my day in the office till tomorrow because I was teaching a workshop on the Laban techniques we learned in London with June and also because I have a meeting that is going to run long, because we'll be discussing the adverse changes made to a recent funding body here that finances independent film... so I'll really not feel like being there tomorrow because I normally am there Mondays (or try to be). Hi, Kizz! 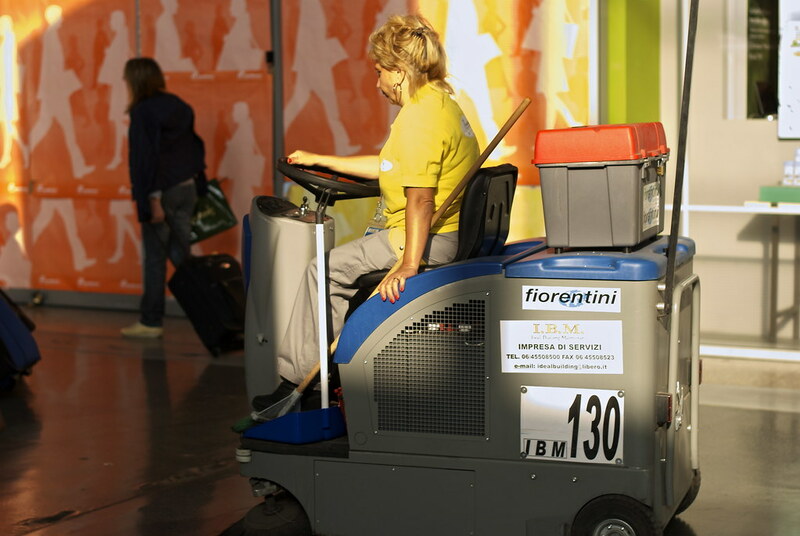 There are times when I'd love to be driving a floor buffer in a Rome train station!! Thanks for your kind remarks on my blog. It is indeed hard to approach the work week when nothing seems to matter. My company has a very structured budget calendar, so it's time for an annual task where we put together a 5 year forecast. Well, of course, my department is being vaporized come June 30, 2013. But nonetheless, we have to put together a 5 year forecast! This would be hilarious, except for the person on our team who is approaching this with deep, sincere, seriousness. We're all going to be gone, and our departments assets will be managed by as-yet-unassigned people, with as-yet-unvoiced goals and priorities. Yet we're crunching numbers to figure out how much they're going to spend on custodial and maintenance in FY2015-16. Maybe I should look at it as a pianist looks at practicing. Creating fantasy budgets are like playing sonatinas! That's not just absurd, it's cruel! You guys need to make the most outrageous budgets possible because, WHO CARES!